In 1978, John Carpenter released that little obscure slasher movie ... y'know, Halloween. Often, it takes a little time and exposure for indie-budget horror movies to catch on and develop an audience, but that film frequently credited with popularizing the slasher genre struck a chord almost immediately, sliding into pop culture and putting the director on the map. 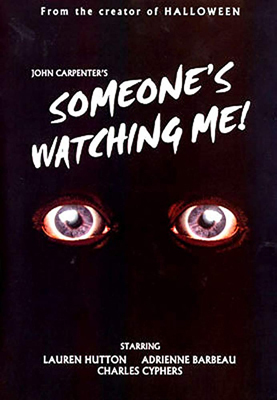 What those who aren't Carpenter devotees might not know is that he released a made-for-TV film in the same year that went somewhat unnoticed: Someone's Watching Me(! ), equal parts psychological thrills and woman-in-distress suspense that also marks the first time he worked with legendary actress Adrienne Barbeau in a significant secondary role, both for its portrayal and its inclusiveness. While there's no escaping either the clear influences, homages, and "borrowings" from other films or the dated tech and dull endpoint to the thrills, Carpenter's execution of TV-safe tension makes it worth keeping an eye on it ‘til the curtains close. Barbeau doesn't play his heroine here, though, a distinction that instead falls upon cult-film starlet Lauren Hutton to embody Leigh Micheals, a director for live-broadcast television programs. After getting away from a vague toxic relationship, she's moved into a high-rise apartment in Los Angeles and taken a job at a nearby station, wherein she meets both men and women behind the cameras, quickly befriending Sophie (Barbeau) and shrugging off instantaneous male advances. Almost as immediately, Leigh begins to receive anonymous phone calls, typed messages, and wrapped gifts from a mysterious source -- not exactly in a threatening manner, but uncomfortably forward and intrusive in their timing. Gradually, the advances turn more invasive, to a point that suggests she's being closely watched and stalked. Enlisting the help of Sophie and a new potential romantic interest, college professor Paul (David Birney), she attempts to cope with the situation … and then, when things get more dire, tries to discover his identity herself. At times, it can be problematic to watch thrillers that hinge on the technological limitations of a bygone era, but if the strength of the tension or themes remain strong enough, one can ignore outdated components and get wrapped up in what's going on. When viewed from a contemporary viewpoint, Someone's Watching Me hasn't aged well: there are repeated calls between landlines that can't be identified, snail-mail scams that'd mostly filter into "junk" email folders nowadays, and other elements that reduce it to a relic from another time. An absence of originality doesn't help, either, as Carpenter cobbles together Hitchcockian characteristics and tension -- most notably, the voyeuristic focus of Rear Window -- with the phone harassment parts of Black Christmas and surveillance paranoia in the vein of The Conversation. With all that distilled into a single production, Someone's Watching Me comes across as limiting and derivative, a made-for-TV patchwork of ideas that have worked on the big screen. What keeps Someone's Watching Me from remaining entirely in the shadows of obscurity -- well, besides that it's an early film of John Carpenter -- comes in the fact that it doesn't treat Leigh as if she's a hapless victim, emphasizing her shrewdness and resilience from the beginning. Granted, you've got to get past some early gullibility on her part and an awkward joke she tells about her fear of being raped by dwarfs, but once those hurdles are crossed, she becomes a reputable example of a woman who won't allow herself to be objectified or harassed. 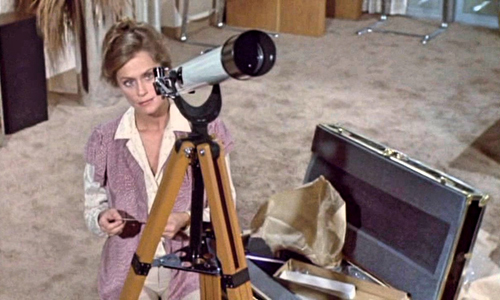 Lauren Hutton's portrayal of the independence-seeking TV director balances increasing fright and decreasing patience, in which she doesn't simply rely on the strength of others for protection or to solve dilemmas. Combined with Adrienne Barbeau's plucky assistant Sophie, whose lesbianism smoothly integrates into the film as meaningful, yet unobtrusive representation, Leigh navigates the measures she's able to take when the authorities aren't as helpful as they should be. Persistent phone calls and swift movements down the hallway leading to Leigh's apartment create stylized, yet predictable and repetitive suspense in Someone's Watching Me, so the intensity of Hutton's performance being channeled into how she investigates the stalker's identity becomes crucial to the film's success. The design of Carpenter's script doesn't leave many options for surprises in the reveal, though, where the components of the mystery could've either resulted in an antagonist with specific, outlandish motivations … or it being somebody unknown and impertinent to what's happened beforehand. While the execution of the approach to this reveal might play out like classic horror a la John Carpenter, with effective fake-outs and amplified reactions from those being stalked, the reveal itself turns out to be remarkably anticlimactic and without resonance or meaning. Someone's Watching Me ends up being a functional studio-controlled suspense film that's entitled to a few good scares due to its iconic director, but it doesn't successfully hit its notes in the ways that his holiday-themed horror outing did in the same year.